Johnny JAG | all galleries >> Various Weardale Galleries >> Views I like > Gentlemens reading room. Taken saturday morning in a gap in the fog. Very neat scene! And, I love your story! totally love this one - seems every sheep is looking for a moment of celebrity! Beautiful shot with the light on the building and the mist on the little town in the background. Interesting history. v.
Really like this. 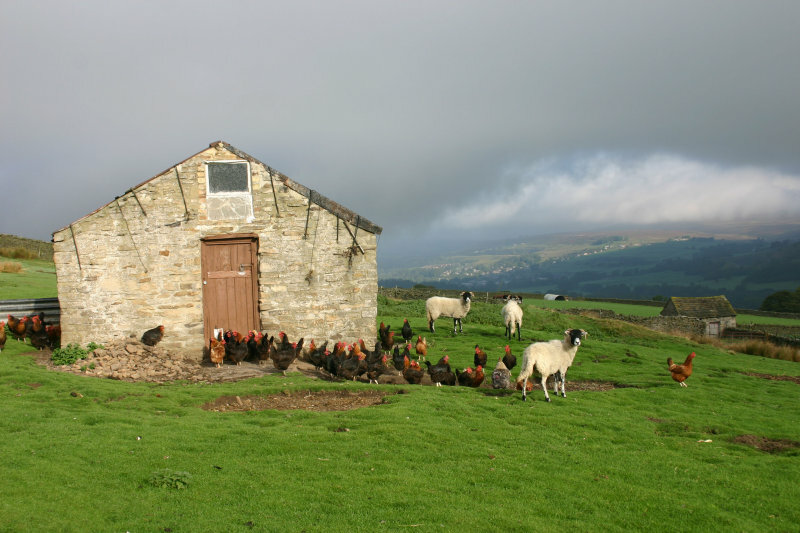 The light, the distant bit of lighted hillside and the great collection of farm animals around the stone hut. Just great. Vote. Oh yes a terrific image and caption. Wow! what a view for a reading room. Wonderful. Terrific shot. Excellent comp and lighting. The hens have seen that rain cloud coming! Beautiful rural scene & gorgeous light! The light is just fantastic. Love how the sheep are looking at you. And now it's a ladies room! This is so gorgeous Johnny, I love the light and landscape and history here! This photos suddenly made me smile. So beautiful image and the little town on the background is also so nice to see. :) Gmv. I love it! All the hens and goats and the house and its story! not mentioning the marvellous landscape and light! Vote!